June 14 is Flag Day in the United States, marking the adoption of the flag in 1777 by the Second Continental Congress. In honor of the day here are a few garden red, white and blues. This ‘Jackmanii’ Clematis bloomed during the first half of April and last week seemed done, but it rallied again today. There are only a couple of blossoms though and of course, it is not really very blue. The red flowers growing underneath this vine are Monarda didyma (Scarlet Beebalm) and they are very red. 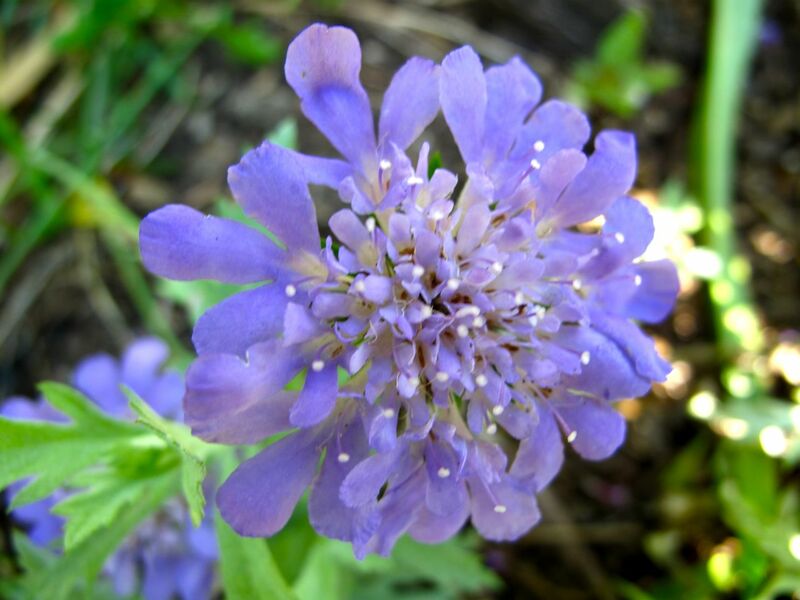 Scabiosa columbaria ‘Butterfly Blue’ (Pincushion Flower) was added to the garden this spring. This is a perennial that always looks so compelling at the garden center, but does perform well in this garden and seldom lasts beyond one year. It may need more sun and definitely requires a lot of dead-heading to keep it blooming. 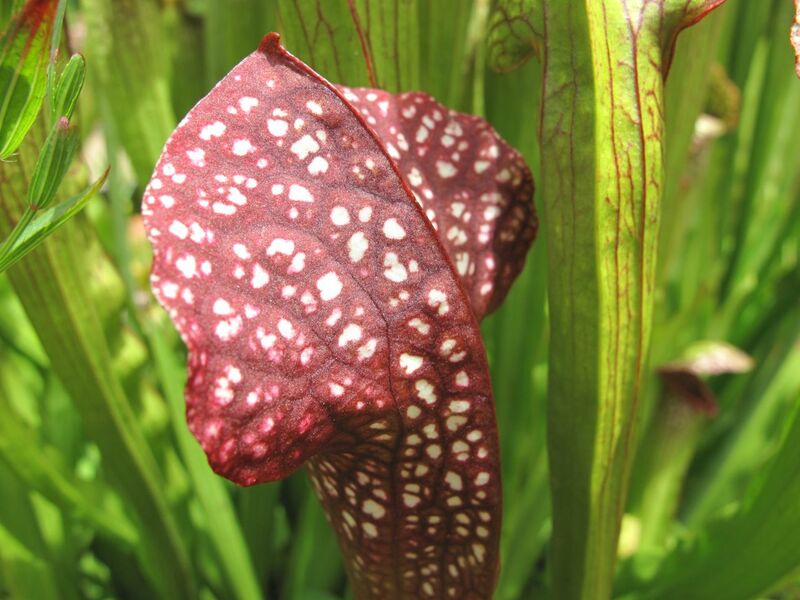 The carnivorous pitcher plants in the hybrid pitcher-plant beds looked amazing this afternoon during a brief walk at the nearby North Carolina Botanical Garden. There are many colorful ones, but this red and white was very interesting. There are two varieties of Leucanthemum x superbum (Shasta Daisy) in the garden, one is probably ‘Becky’ and the other, ‘Alaska.’ One has been blooming since the last week of May, while this one is only now starting to open. The earlier-blooming one is taller with narrower leaves. Leucanthemum x superbum (Shasta Daisy) 2012-06-14 – This image by pbmGarden is licensed under a Creative Commons Attribution 3.0 Unported License. Leucanthemum x superbum (Shasta Daisy) 2012-06-14 by pbmGarden is licensed under a Creative Commons Attribution 3.0 Unported License. 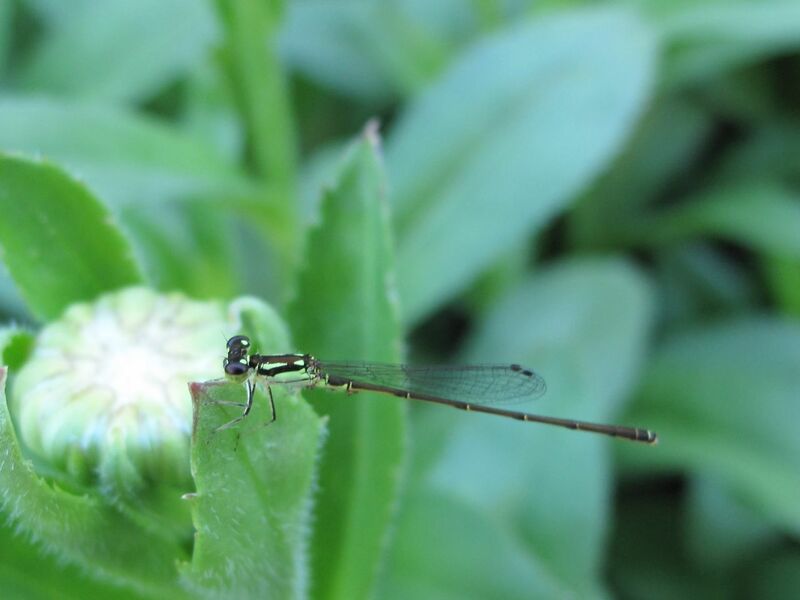 This entry was posted in garden and tagged clematis jackmanii, garden photography, nature photography, Scabiosa columbaria, shasta daisy on June 14, 2012 by pbmgarden. Love the pincushion flower…very aptly named! Something to try in your new garden? 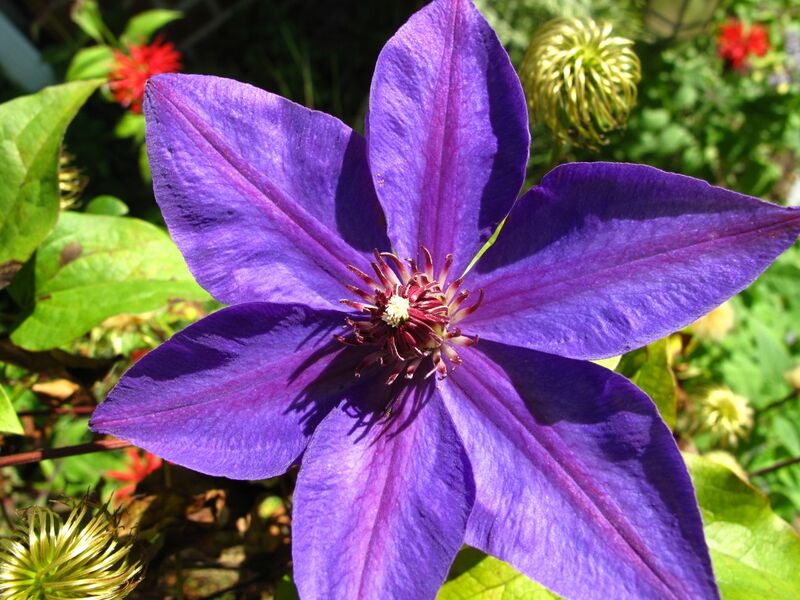 The clematis is lovely, and I loved your last photo! I have white scabiosa (in full sun) and they seed themselves around… I’ve had to pull up literally hundreds of seedlings this year. It just gets too big to deadhead. The butterflies love it though! I appreciate your comments. Wow! Hundreds of seedlings I don’t need but maybe my scabiosa could use more sun to make it stronger. Bet your white one is pretty–I’d enjoy seeing pictures. Does it have a long blooming period in your area? It will take another couple of weeks before it flowers, but will post it then. It lasts till late September, by which time it has got so tall and wild I have to cut it down! It has very tough deep roots once it’s established, so I have to watch those seedlings! That Scabious is a good colour. I don’t think it is available in the UK but shall look out for it. Could I ask a favour? My daughter, as part of her jewelry course, is basing her designs on patterns in nature especially the Fibonacci sequence. 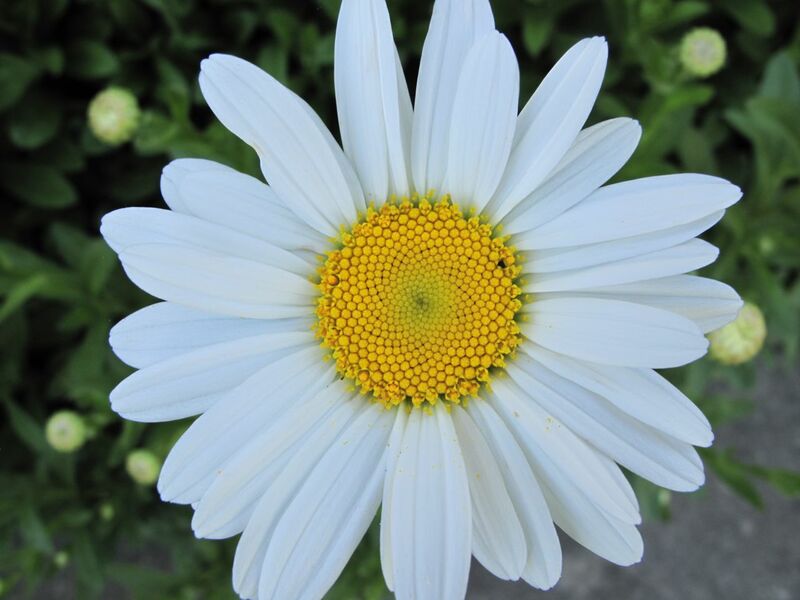 Your shasta daisy photo shows this perfectly. Could I possible copy it for her to use please? Yes, I’d be happy to let you use the photograph for this. I licensed it under Creative Commons so you can copy it. Thanks.